Recently, I watched a documentary about the insanely athletic professional rock climber, Tommy Caldwell, on his journey to climbing the iconic El Capitan of Yosemite National Park. Over the years, he had perfected the handful of routes that have been climbed up the 3,000-foot slab of sheer vertical granite. However, the Dawn Wall, the first section of El Capitan to see the sunlight, had never been free-climbed in its entirety until Tommy came along. After seven years of studying the wall, Tommy and his climbing partner, Kevin Jorgeson, set off to attempt what all the pros considered to be an impossible task. They divided the journey into 32 sections, or pitches, with a goal of climbing 1-3 pitches in a day before heading back to their base camp (and by base camp, I mean a tiny tent attached to the wall thousands of feet above the ground: hard pass). When the pair got to Pitch 15, arguably the most difficult of the entire journey, they had to laterally traverse a 70-foot section of the cliff with barely any texture to cling to. Tommy accomplished the pitch, while Kevin struggled for days as he watched Tommy get further and further up the wall. Eventually, Tommy got to a point on the wall where, after a few weeks of nothing solid under his feet, he was finally able to fully stand on a ledge. Immediately overcome with emotion, he came to the realization that Kevin had to experience the fulfillment of accomplishing this wall in its entirety. Instead of putting his own victory as the sole line of his vision, Tommy insisted on seeing his climbing partner relish in the success of completing the full climb: together. You can check out “The Dawn Wall” on Netflix to discover how the documentary ends, but let’s get to the point of this blog: celebrating the success of others. Because let’s be real: how many of you would’ve insisted upon your friend’s success when yours was just a few hundred feet away? When accomplishing something you sought out to do seven years ago, was just an hour or so away from completion? When going down as the first person in history to free-climb the Dawn Wall of El Capitan had your name – and only your name – written all over it? Would you be able to give up a legendary status to make sure your friend could take in the experience with you? Okay, so maybe we aren’t climbing the heights of El Capitan at Impulse, but the people inside the walls of this facility are still accomplishing HUGE goals! It’s amazing to see others reaching success they’ve worked so hard for, right?! Guys, it is human nature for us to feel green with envy, but WHOA! Grab yourself a slice of humble pie, will ya?! And while you’re eating that slice of pie, take in some of these tidbits on The Celebration Principle from John Maxwell’s book, “Mentoring 101”. 1) The joy of the accomplishment is diminished when no one celebrates with you, so celebrate others! I will never forget the day I conquered the 36-inch box jump. I had been practicing, practicing, practicing during my personal training sessions with Josh, and it finally happened. I stood there on top of that box in shock and trying to compute in my head if that actually just happened. That’s when I realized Josh was running circles around me with his hands held high in the air, hootin’ and hollerin’ to confirm that I did, in fact, just jump 36 inches off the ground. I started laughing and immediately felt the joy …because he felt the joy. It takes a simple, genuine action of pride to celebrate others and allow them to relish in victory. It can sometimes take effort on our part to shove our jealousy to the side, but be happy knowing that you get to witness and be a part of a potential game-changer in someone else’s life. Someone is getting better, because you were there to encourage them and show your happiness for them. 2) Remember that the process of your health journey is not a competition with others. 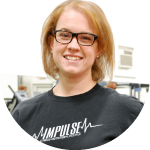 My Impulse people, these are simply tools to help you have goals to achieve your highest potential in your health journey, not to be the first to get to the top. Think about it like this: it’s like doing a workout at home by yourself. Sure, you’re drenched in sweat, you got some nice MEPs, and your body could use some Deep Blue Rub. But could you have gone longer, harder, faster? ALWAYS. And that’s why you go to the gym: to get that extra push from your trainer and gym family to go the extra mile to BETTER YOURSELF. Not BE better than someone else. 3) What hinders people from success often keeps them from celebrating others’ success. Working in the health and fitness industry comes with its own set of challenges, especially during the seasons when my battle with depression and anxiety can cause me to slowly backslide into bad health habits. During the valleys of my personal journey, it takes a lot of energy to do anything, let alone be chipper and cheery for others as they crush goals left and right that I am far from accomplishing. It is a daily (sometimes hourly) effort to push aside my health struggles in order to help others celebrate their victories, but it’s a choice I choose to make. Because for one, I know how amazing it is to accomplish goals. I would never want to darken that experience for someone else or make someone to feel like they didn’t just do anything less than conquer the world. And two, you guys are 100% completely inspiring others, myself included, when you achieve these milestones. It’s a win-win in any case: You get the victory, and the rest of us get inspired! As we enter into the next season, let’s not only run full force toward our own goals, but let’s also make a conscious effort to celebrate others as they see victory after victory in their health journey. There should be no difference in how we celebrate each other, whether someone is trying to climb the heights of El Capitan, complete a half marathon, or push a plate across the turf without stopping. Every victory is worth celebrating. Every victory is worth sharing.